Cirque du Soleil is at its heart a traveling circus, but it’s also a ballet of sorts. Each Cirque du Soleil show attempts to tell a story, or at least unites the acts in a common theme while drawing the audience in to the well-known color and grandeur. This review is from the 2011 Thanksgiving matinee performance of TOTEM during their San Francisco fall run, but this is the same troupe coming to San Jose in March 2012 via the scenic route after wintering across the pond in London, UK. TOTEM is a spectacle, bound by the exciting journey humans have taken in the past and forecasts their potential to adapt and grow through time. Its loose story draws on legends from many cultures, starting with a giant turtle center stage. It artfully gives way to the amphibious beginnings of humanity, then takes us through primate evolution, and ultimately looks ahead toward potential future states while keeping in mind man’s desire to fly. While the show doesn’t strictly adhere to the story at all times, if spectators want to follow the plot more easily, it would behoove them to either buy the souvenir program, or read the summary information available on the Cirque du Soleil website at: about TOTEM. Even going in cold, admirers are in for a treat. 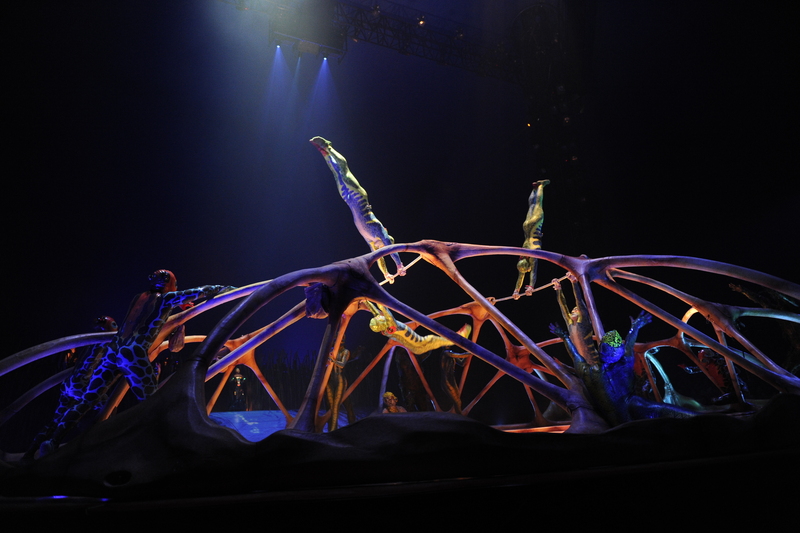 Following a slow pre-show entrance of several characters warming up the gallery from all sides, the main attraction starts with a burst of energy as an alien visitor, dubbed Crystal Man, drops from the center of the big top animating the dark turtle, causing the turtle’s covering to be whisked away leaving behind its bony carapace inhabited by acrobatic amphibious creatures within. While Cirque du Soleil is devoid of traditional Barnum and Bailey animal acts, they are not missed. Acrobats perform gymnastic routines on rather creative equipment ranging from the carapace, to flexible bars used as kind of a trampoline, to building a 33 foot pole to swing from and balance upon. The acrobats’ strength and agility are impressive, and each time they appear, distinctive colorful costumes aid their portrayal of different states of development. A circus also has to have a trapeze act, and TOTEM doesn’t disappoint, this time done in a light-hearted seduction reminiscent of schoolyard antics all the while suspended high above center stage. Beyond the acrobats, there are other precision acts, such as a pair of hoop dancers, a team of unicyclists, jugglers, and of course magicians, the details of which will not be divulged here. And there is music, some electronic, some acoustic but amplified. In one sequence a number of able Flamenco guitarists and percussionists emerge from the upstage reeds to expertly accompany the hoop dancers. There’s even a “scientific” juggling/magic act accompanied by a chorus of percussion and “pan flute” played on “lab equipment”. As an engineer, this reviewer can appreciate the technical aspects of the show as well. The “village on wheels” takes 8 days to erect, and 3 days to deconstruct on each tour stop. Within the Grand Chapiteau’s performance space, a portion of the upstage section is used for lifelike projections of oceans, rocks, flames, lava, etc, at times kinetically triggered creating some intricate effects. Upstage center is a mobile platform modeled after a retractable pedestrian bridge in London that transforms itself and transports cast members against varied tableaus. While not a criticism per se, there are safety measures in place which are noticeable at times. To the designers’ credit, the safety measures are not disruptive, and in fact are utilized as part of the act such as safety wires not only being there in case of a fall, but also used to quickly launch some of the acrobats. The few small criticisms noted last Thanksgiving are minor. While all circuses tend to have clowns of one sort or another, in TOTEM, there are two. They are too prevalent, and their segments drag compared to the more acrobatic moments. Next, the climate controls within the Grand Chapiteau can fall a tad short when the house is filled to capacity (over 2600 audience members) and the space tends to warm up quite a bit as the show progresses. Also a warning for those with sensitive hearing, bring earplugs as the music is periodically over amplified. Lastly, given the performers are human, some mistakes are inevitable, and occasionally something is dropped. Cirque du Soleil’s TOTEM is a show unlike more traditional American circuses that’s well worth seeing, and the San Jose tour stop runs 2 March – 1 April 2012 under the Grand Chapiteau at the Taylor Street Bridge in San Jose.